Henry Aaron pioneered No. 44 as a number reserved for sluggers, and fellow Hall of Famers Willie McCovey and Reggie Jackson solidified the trend. For the Mets, the 44 jersey has often found its way onto the backs of guys who only think they’re power hitters. There was Jay Payton, who had all the muscle of a power hitter but a delicate frame and a line-drive bat. Ryan Thompson could hit it out of the park in interviews but was never as ferocious at game time.Lastings Milledge and his similarly powerful mouth wore out his welcome in less than two years (and only 11 Met home runs).Mike Cameron slammed 30 home runs in 2004 but his hardest hit as a Met was a gruesome collison with teammate Carlos Beltran in 2005. What’s a Met 44? It’s Howard Johnson in May of 1991 switching to No. 44 in an attempt to jump-start his game, only to scurry back to his familiar No. 20 in less than a week when his wife reminded him her jewelry all included the No. 20. It was reserve catcher Harry Chiti, acquired from the Cleveland Indians in 1962 for a player to be named later — Harry Chiti, and the Mets would get fleeced. It was four different players as recently as 2008, and I can barely remember any of them: Brady Clark, Tony Armas, Eddie Kunz and Brandon Knight. They threaten to join Kevin Lomon and Tom Filerand Bob Rauch, to name three Met pitchers who wore 44 in my fan lifetime and of whom I retain no specific memory whatsoever. 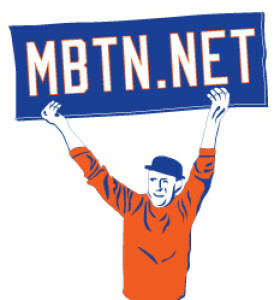 Like everything in Mets history, 44 was good for a stretch in the mid-1980s — Ron Darling and David Cone each wore it before switching to other unis — but it wasn’t long before 44 was again the domain of guys like Tim Burke and John Cangelosi and Jay Bell, who I still can’t believe chose sticking out to the bitter end of the 2003 campaign over retirement, or the Mets for allowing him . It’s into this dysfuctional family that Jason Bay officially arrived in a Met press event today. Bonne chance, Jason! Ya gotta believe! number most recently belonged to reliever Royce Ring. Two regulars on the shelf from Day 1 return this afternoon when Kris Benson 34 makes his first start and Mike Cameron 44 plays right field. To make room the Mets sent reliever Royce Ring 22 and starter Jae Seo 26 to the minors. Tough break for Seo, who pitched better than both Tom Glavine and Victor Zambrano during his stay. He may be back if either of those two continue to struggle. 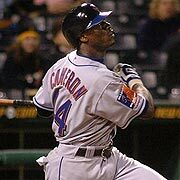 Once again, Jim Duquette got his man, overcoming heavy competition and filling a gaping hole in center field by signing Mike Cameron to a 3-year deal. Cameron is likely to suit up in No. 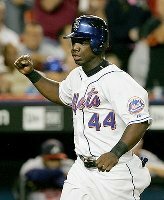 44 for the Mets, digits most recently belonging to the mercifully retired Jay Bell, as well as former Met center fielders Jay Payton, Ryan Thompson and John Cangelosi.